In .NET, the collection framework plays a very important role. The System.Collections namespace and System.Collections.Generic namespace provide a set of collection classes which are used for In-Memory data store for an application running on the client machine. Note: Hashset is a collection of distinct values. In Data-Centric applications a.k.a. applications which have to perform a large amount of Read/Write operations on the Database, need to store the state of the data in the local memory (cache) where the client application is executed. Although caching is not mandatory, but the benefit of this approach is to increase performance of the application. This reduces frequent calls to database and hence helps in improving the application performance. The collection classes are helpful to maintain the state of the data In-Memory, which is later available for read/write operations. There are two types of sets, SortedSet and HastSet. The SortedSet stores data in sorted order and also eliminates duplication. Both the classes store non-duplicate items. However if you want performance and do not care if the items are stored unsorted, then go in for HashSet. 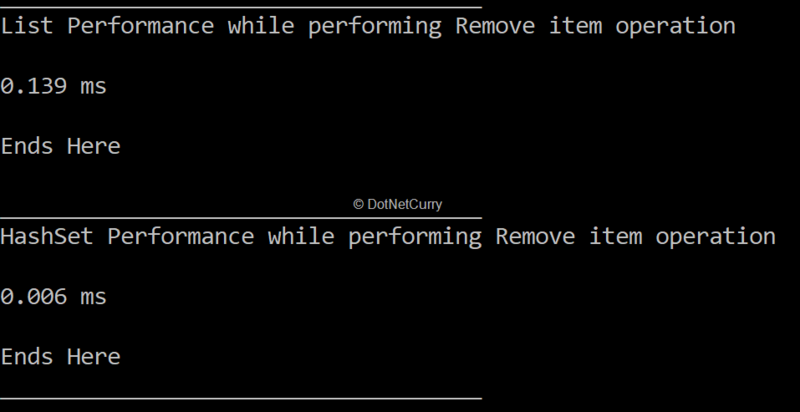 However if you want the items to be sorted after insertion but are ready to take a performance hit, chose Sorted. Section 6: Checking performance of operations like Add, Remove, Contains on HashSet and List. Here are some salient features of HashSet. This class represent a set of values. This class provides high-performance set of operations. This is a set of collection that contains no duplicate elements and there is no specific order for the elements stored in it. In the .NET Framework 4.6 release, the HashSet implements IReadOnlyCollection interface along with the ISet interface. The HashSet class does not have any maximum capacity for the number of elements stored in it. This capacity keeps increasing as the number of elements are added in it. Step 1: Open Visual Studio and create a Console Application of name CS_Using_HashSet. //5. Printing Data in HashSet, this will eliminate duplication of "mahesh"
1. declare an array of string of name names, which stores names in it. This array has a duplicate entry for string “mahesh”. 2. print(s) the length of array and data in it. 3. defines a HashSet of type string. This object is initialized using array which adds items in HashSet from the array automatically. 4. 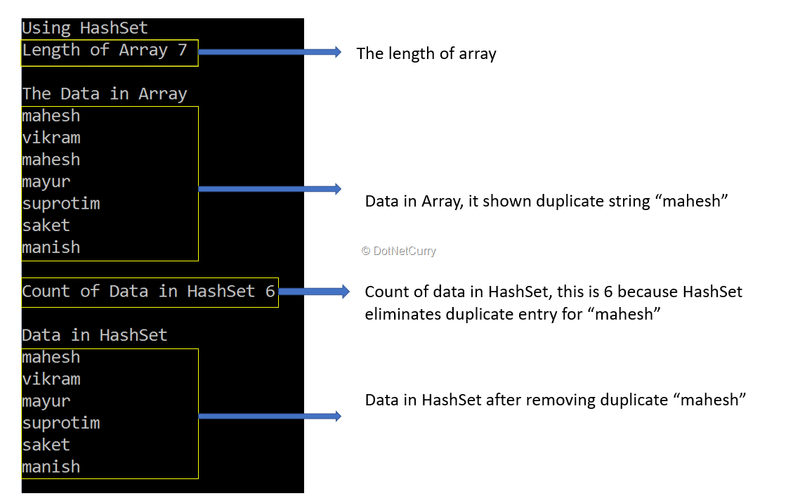 As discussed in Section 1, the HashSet object does not allow duplicate entry, hence the result will show the count of the data present in the HashSet less than the array count. 5. displays the data in HashSet. The UnionWith() method is used to modify the HashSet to contain all elements present in itself along with elements in other (IEnumerable) collection with which the union is established. The following code is the implementation on UnionWith(). Step 1: Add the following code in the Main() method of the project. 1. Array objects declare Names1 and Names2 which contains string data in it. 2. This step defines two HashSet objects hSetN1 and hSetN2 based on names1 and names2 respectively and data from both HashSet is printed. 3. This step calls UnionWith() method on the hSetN1 and passes hSetN2 object to it and displays all data from hSetN1 after union. This method is used to modify the HashSet by removing all elements which match with elements in another collection. Step 1: Add the following code in the Main() method. The code uses hSetN2 declared in Section 3 and declares a new HashSet using the names1 array which is used to declare hSetN1. The above result shows that when the ExceptWith() method on the hSetN3 HashSet is called by passing hSetN2 parameter to it, then the matching string ‘mahesh’ is eliminated from the hSetN3 and remaining strings are displayed. This method modifies the HashSet object to contain those elements which are only present in one of the two collections, but not both. All the matching elements will be removed. Step 1: Add the following code in the Main() method. The code useshSetN2 declared in Section 3 and declares a new HashSet hSet4 using an array names1. The SymmetircExceptWith() method is called on hSetN4 HashSet by passing hSetN2 HashSet to it. Both these HashSets contains a string name “mahesh”. 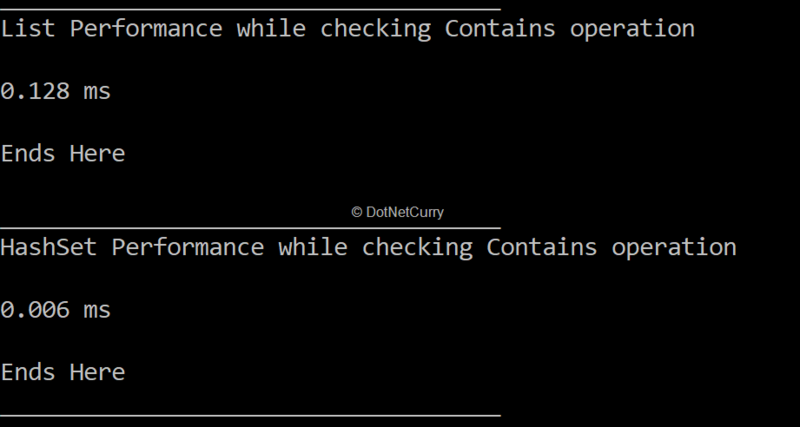 Section 6: Checking performance of operations like Add, Remove, Contains on HashSet vs List. All of the above sections have explained various methods of the HashSet. But when a developer wants to make a decision for selecting the most suitable collections type based on the performance, then it is important to check which operations are frequently performed on the collection. The above method performs Add() operation on the List and HashSet by iterating strings from the names array. Operation performance is calculated using the StopWatch class from System.Diagnostics namespace. Please note that the following results shows difference of time on my machine, it may differ on your machine when the sample is executed. The List<> takes less time to add strings when compared to HashSet. The reason behind this is List.Add() simply adds an item to the list whereas HashSet.Add() will skip new item if it (is)equal to one of the existing items. This takes time to execute HashSet.Add() method as compare to List.Add() method. The result clearly shows that the HashSet provides faster lookup for the element than the List. This is because of no duplicate data in the HashSet. The HashSet maintains the Hash for each item in it and arranges these in separate buckets containing hash for each character of item stored in HashSet. When the lookup occurs, the HashSet hashes it and jumps it to the matching bucket for each character starting from the first character and extracts the element from HashSet. The above image clearly shows that the Removal operation of HashSet is faster than the List. The Remove operation also works similar to the Contains operation. 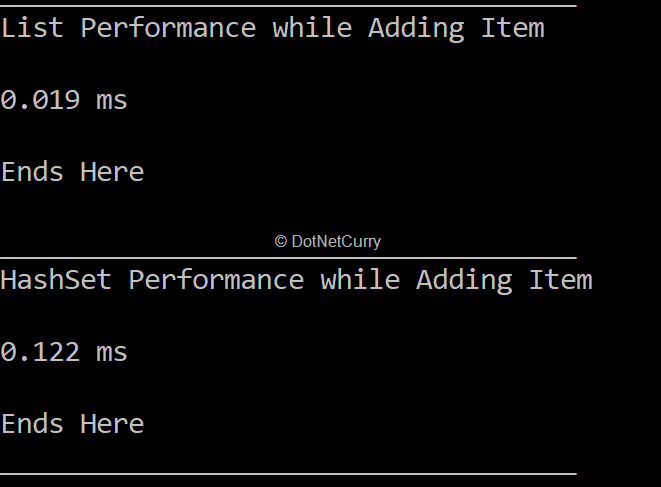 Conclusion: HashSet in C# .NET is a high-performance collection store. 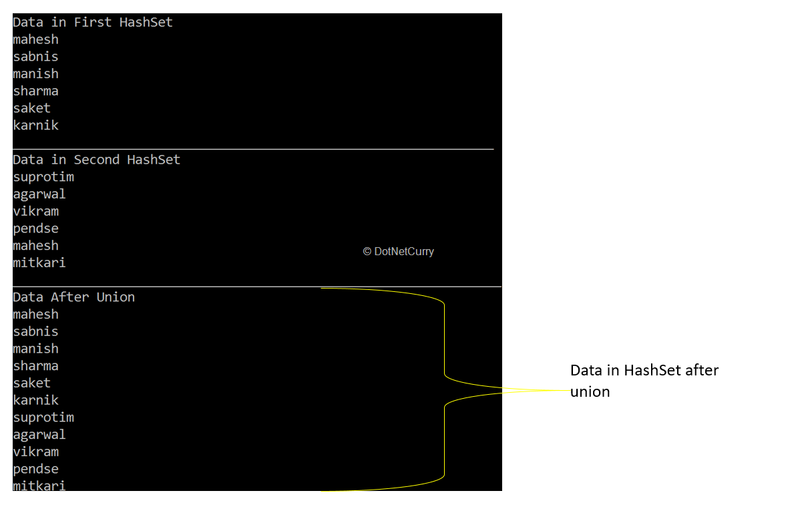 The advantage of using HashSet object is to perform standard operations like Union, Intersection, etc. which provides an easy and maintainable coding experience. On the other hand, List object has the feature of item ordering, duplication, etc. So based on the requirements of data handling, one can take a wise decision for choosing an appropriate collection.